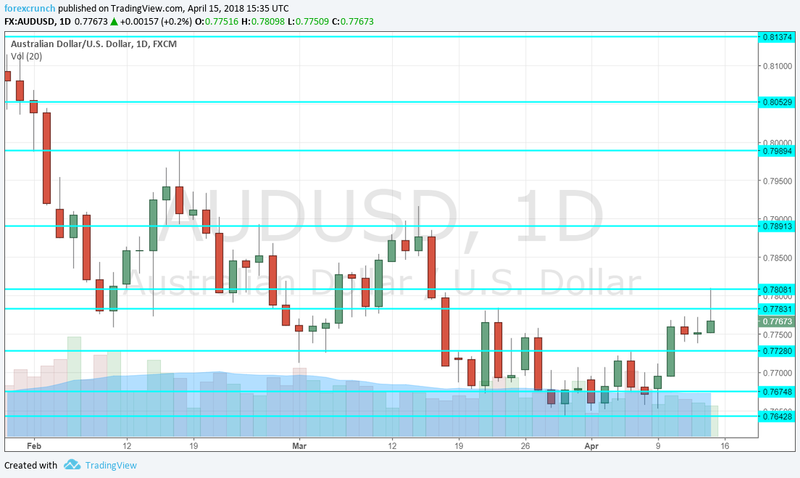 The Australian dollar advanced nicely as trade came back to fashion once again. The upcoming week features the RBA minutes, Australian jobs and the Chinese GDP. Here are the highlights of the week and an updated technical analysis for AUD/USD. Australia needs flowing trade to flourish. After China and the US moved from trade wars to pleasantries, the Trump Administration is also considering a return to the Trans-Pacific Partnership that Australia is part of. This pushed up the risk-on Aussie. In Australia, RBA Governor Lowe said rates will likely remain unchanged for quite some time, repeating his previous positions. In the US, the Fed meeting minutes showed confidence about the economy and about the inflation target. And indeed, core inflation really advanced to 2.1%. Concerns about Syria weighed on markets. However, after the airstrikes and the lack of any follow-up, the mood will likely be positive again. Monetary Policy Meeting Minutes: Tuesday, 1:30. The Reserve Bank of Australia left the interest rate unchanged in March and also refrained from altering the wording of the statement. The meeting minutes will likely confirm the neutral stance while expressing concern around wages and debt amid satisfaction about job growth and the global expansion. Chinese GDP: Tuesday, 2:00. The world’s second-largest economy publishes its final GDP read quite early after the quarter ends and many suspect the data may be inaccurate. This will be the first read for Q1. The annualized growth rate in Q4 2017 was 6.8%, in line with the goals of the government. A repeat of this figure is projected for Q1 2018. MI Leading Index: Wednesday, 00:30. The Melbourne Institute’s Leading Index provides a wide overview of the economy. After a rise of 0.3% in February, March could see a more moderate growth rate. Jobs report: Thursday, 1:30. Australia has seen a moderate increase in jobs back in February: 17.5K, in line with estimates. The unemployment rate stood at 5.6%. RBA Governor Phillip Lowe said that interest rates are unlikely to change anytime soon, but changes in the labor market will undoubtedly have an impact. Expectations are slightly higher this time: a gain of 20.3K jobs and an unemployment rate of 5.5%. NAB Quarterly Business Confidence: Thursday, 1:30. Somewhat overshadowed by the jobs report, this wide survey of around 1000 businesses dropped to 6 points in Q4 2017. The figure for Q1 may be similar, but watch out for revisions: many of the previous reports contained upwards revisions to previous numbers.